Time for another Community & Business Women’s Network Sparkle event! An opportunity for local organisations, services and businesses to shine like the stars they are! 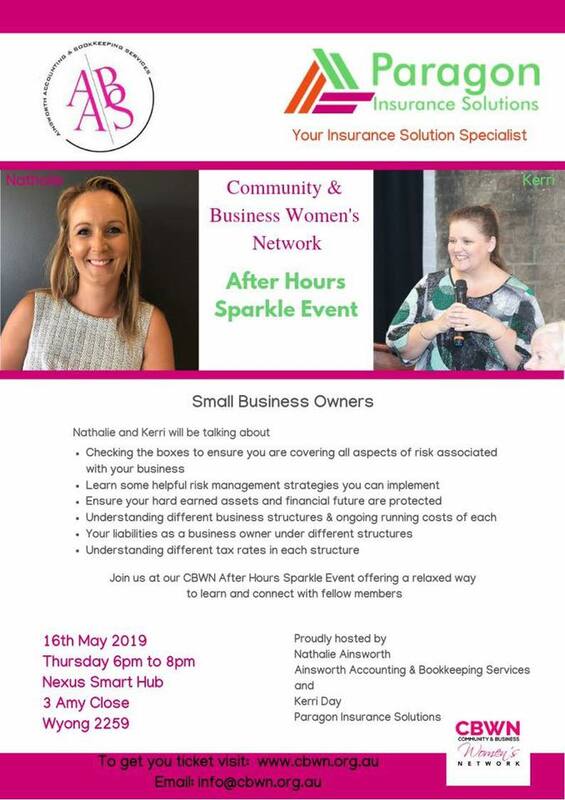 Our May 16th Business After Hours Sparkle hosts are CBWN members @Kerri Day Paragon Insurance Solutions and Nathalie Ainsworth of Ainsworth Accounting and Bookkeeping Services. Local business professionals Kerri and Nathalie will share with us what’s important to run a successful business, how to ensure your assets are safe and how to keep track of your finances. You will learn how to make the most out of your current data to plan ahead and move your business in the direction you choose. Join us for a unique networking experience, Light refreshments provided. Limited tickets available, grab yours today!